Sometimes, even a dusty, barren desert can give you reasons to go green. 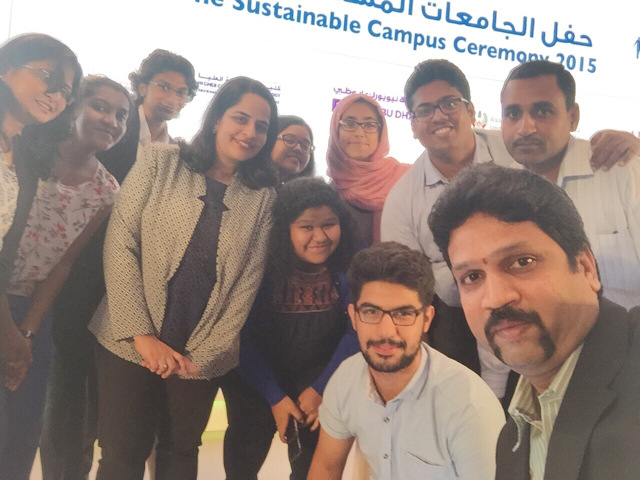 The Manipal University, Dubai campus won the “Best Green Campus Audit 2015” and “Runner up Sustainability Action Project 2015”, as part of the Sustainable Campus Initiative (SCI) by Environment Agency, Abu Dhabi. Supported by the Ministry of Higher Education & Scientific Research, UAE, the initiative seeks to encourage more efficient use of resources by students and institutions. The SCI winning team, including students from the Environment and Conservation Club, from Manipal University, Dubai. This dedication definitely shows – and how. While its parent campus in Mangalore, India, has created a reputation for itself nationally and internationally for being an environmentally conscious university – it ranks first in India and 35th globally in the Universitas Indonesia’s Green Metric World University Ranking – the Manipal Dubai campus is not far behind. In its list of accolades, in addition to the SCI win, the University also holds the 2013 – 2014 Conservation Award, organized by the Dubai Electricity and Water Authority (DEWA) in partnership with the Knowledge and Human Development Authority (KHDA). Manipal University beat out several private and governmental institutions for the honour – such as the American University of Sharjah, Zayed University, New York University, UAE University, Khalifa University and Abu Dhabi University to name a few. The institution’s efforts to encourage sustainable practices hold evidence throughout the campus. From a “Green Orientation”, which involved games with an environmental theme and a paper collection drive to welcome the newest batch of students, to the discouragement of water wastage in washrooms, to the maximization of natural light use in classrooms and the dedicated smoking area. Additionally, the enthusiastic Conservation and Environment Club reminds students to take the stairs by use of stickers proclaiming “Burn Calories, Not Electricity!” near lifts.